After the pathetic attempt at a training run documented in my last post things have not been getting much better as far as training is concerned. As I felt really knackered (with a cold and a shoulder injury sustained at British Military Fitness) I decided to have a week off of training and did nowt for a complete week – no worries I still had plenty of time to train for the P Coy Challenge….. Easing myself back into training I started with a couple of free runs i.e. no weighted pack and enjoyed myself. 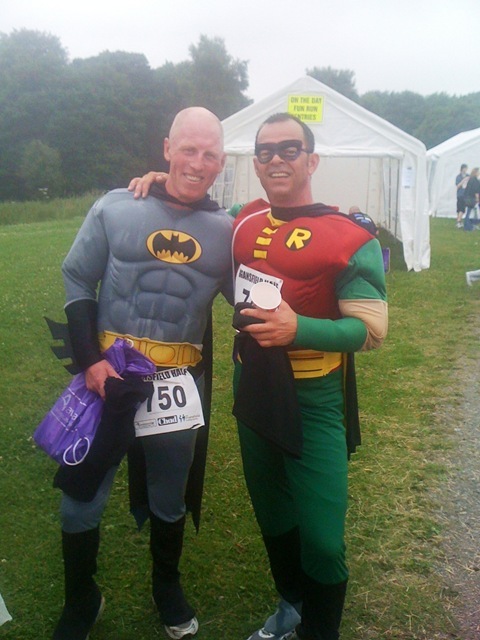 I then had the Mansfield Half Marathon to run with my mate Bunde – we’d decided to do the race dressed as Batman and Robin (we were more like the Only Fools & Horses versions than Batman The Beginning). Dressed in a costume with full leg and and arms covered and with rubber chest muscles we walked to the start line for a 10 o’clock start and I was already sweating like a mad man. We bumped into a serving RAF bloke who was carrying a 35lb pack and wearing military boots – Para 10 style (much respect to him as he completed the course in 2:35). The race was a nightmare – after about 5 miles I had to stop for a call of nature (or a Paula Radcliffe as it’s known) and I was glad of the rest. Bunde had told me that the course had been altered to make it a bit flatter but we’d already ran up and down 5 fairly big hills and there were more to come. I struggled round the course which ends with a lap of a running track to the finish and I had just enough to beat a girl who made the same mistake as I did in the Ashby 20 – she declared “I must beat you fancy dress guys“ – it’s amazing how those word can galvanize you to make a final effort. Anyway, a small victory but my time was shocking 2:05 – the slowest time I’d ever recorded for a half marathon by a long way – my first ever half marathon time was 1:48. I was really hacked off by this and felt absolutely deflated – “How the hell am I going to get round the Para 10 challenge with weighted pack and boots in 1:50 if I was recording 2:05 for a half marathon?”. Still, there’s still plenty of time to train for the Para 10……. My next run on the 1st July, was a simple lunchtime bimble from the office for about 5.5 miles run at a reasonable pace but it all went wrong at 3 miles. 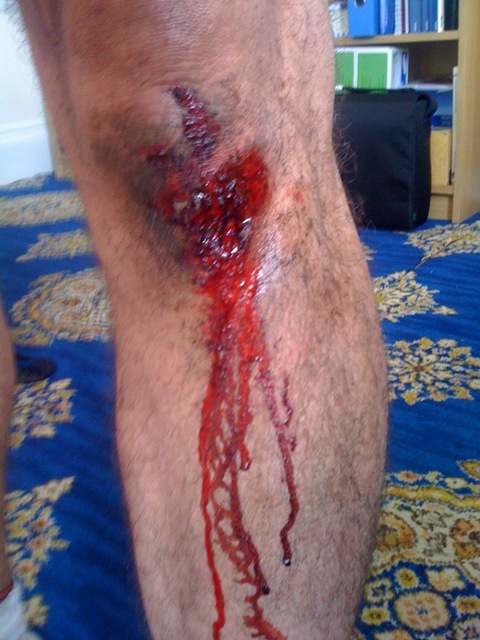 Running off road, downhill with my mate Mark running and chatting easily I managed to trip and fall flat on my face. Picking myself up I checked myself out and saw my left knee had an inch gash clear through the skin layers :-(. As we were about half way round we pressed on and finished the run – my knee didn’t hurt and didn’t bleed much either. If you don’t want to see a hideous picture look away now (I’m talking about the carpet rather than the knee injury :-> – our office landlord assures us that this is a period style carpet!). I ended up with 4 stitches in my knee and this effectively ended my training for another week and a half ‘til the stitches were out. Still, there’s still plenty of time to train for the Para 10……. A simple bimble followed by a run with my boots then a pack run with boots, then another cold :-(. Another pack run of about 4.5 – 5 miles in boots and my feet are beginning to suffer. Still, there’s still plenty of time to train for the Para 10……Hang on, NO THERE’S NOT – there’s 7 weeks to the race, meaning only 6 weeks to train and the last week should be a train down so there’s not much time left at all. Which brings me up to date. The alarm rang at 06:15 and I sprang out of bed (kind of). I’d planned a 30lb pack run of about 6 miles with Bunde but I forgot to add more weight to the pack. The weather was quite cool and dry but rain had been predicted and we wanted to be done and home before it started. Bunde had changed the route that we were going to tackle and he thought it would be about 7 miles. Off we set, and after about a mile it was a fairly big climb (some 150 metres) before we dropped back down the same height to the canal – along the canal, round the reservoir (all slightly uphill) and to the foot of Monument Hill. We climbed this hill (some 80 metres or so) and turned round to head back down the hill. My stride length up the hill was barely longer than my foot length which was reflected in the time. Our usual time up the hill is 2 minutes 15 and today with the pack we took 3:30 which wasn’t too bad – the descent time was 2 minutes 15. Back at the foot of the hill I felt not too bad but I could really feel the weight of the pack. Back onto the canal, through the village and back home, I stopped my watch at 1:23 – 83 minutes for a distance that Google Maps shows as 8 miles, don’t forget to avoid stalkers I always start my routes from the centre of the village not my house which is a quarter a mile away so 7.5 on Google = 8 miles in the real world. After the crappy 5 or 6 weeks I’ve had I’m pleased with that, I’d like to have been a bit quicker as there’s gonna be more hills on the Para 10 but I’ll take that. Things are looking up but there’s still a lot to do, more weight in the pack, another 2 miles and 2 more hills and about 10 pounds to lose…. My feet are in tatters with blisters everywhere and a black toe nail which I reckon indicates that I’ll lose it in the very bear future and it’s gonna be a pain to put the boots back on – thankfully that wont be until Wednesday night as it’s 6 mile free running tomorrow night…..
As a footnote, it’s worth saying that my running partner has fallen over twice on his last 2 runs. Thankfully he has had no real injury but has the hoodoo been passed on? This entry was posted on July 26, 2009 at 09:53 and filed under Uncategorized. You can follow any responses to this entry through the RSS feed. You can leave a response, or trackback from your own site.